The darlings of the summer barbecue, ribs can also be cooked indoors year-round in the oven. Baked slowly at low heat, they'll come out juicy and tender. Use mesquite seasoning or liquid smoke to mimic the flavor of an outdoor grill and allow about two hours from start to finish. Spare ribs come from the mid-to-end portion of the hog's rib cage and are tougher, larger and meatier than baby back ribs. When buying spare ribs, you have two options: complete spare ribs, which include the rib tips and skirt, which are cut away before grilling, or St. Louis-style ribs. A full rack of untrimmed spare ribs weighs 5 to 6 pounds; once trimmed, the ribs weigh 3 to 4 pounds. St. Louis-style spare ribs may cost a bit more, but they've already been trimmed to a nice, manageable size. 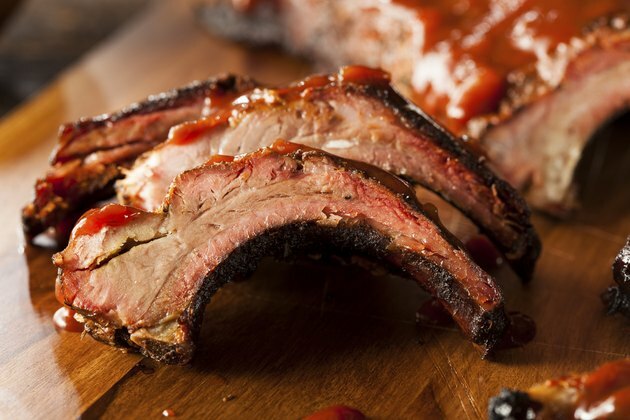 St. Louis spare ribs weigh between 2 and 3 pounds and serve two or three people. Spare ribs, like any tough cut of meat, need slow cooking at low temperatures to become tender and juicy. Set them on a baking rack placed on a baking sheet and bake them at 300 degrees Fahrenheit for 1 1/2 to 2 hours. You can cook the ribs uncovered, or pour a bit of apple juice in the pan and cover the ribs with aluminum foil. Both methods yield delicious results, but braising the ribs under aluminum foil prevents dryness. Remove the foil and crank up the heat to 500 F during the last 5 to 10 minutes of cooking to create a golden-brown crust. Ribs baked in the oven won't taste exactly like those cooked on a grill, but when carefully seasoned, they come close. Combine your favorite seasonings, such as salt, pepper, garlic powder, chipotle chili powder, brown sugar or rosemary to make a savory rub. Massage this mixture into the meat before cooking. As the ribs bake, you can add additional flavor in several ways. Baste the ribs occasionally with a mopping sauce, which is simply watered down barbecue sauce, or brush the ribs during the last 30 minutes of cooking with a mixture of melted butter and liquid smoke. Brush barbecue sauce on the ribs during the last few minutes of cooking or serve the sauce on the side. You probably won't have any leftovers, but if you do, wrap them tightly in aluminum foil and refrigerate them within two hours of serving. To reheat them, place the foil packet in an oven heated to 350 F for 20 to 30 minutes, or until the ribs are hot.